Hello survivors! It’s finally here! The DLC “Battle Of The Heodenings” is finally available! Today, we’ll go through the main features of the new DLC, and we’ll also present the patchnotes of the 1.3 patch! This mode redefines one of the main goals of Dead In Vinland: survive. Now, you are free to choose your team to survive as long as possible, in this endless, sandbox-y mode! 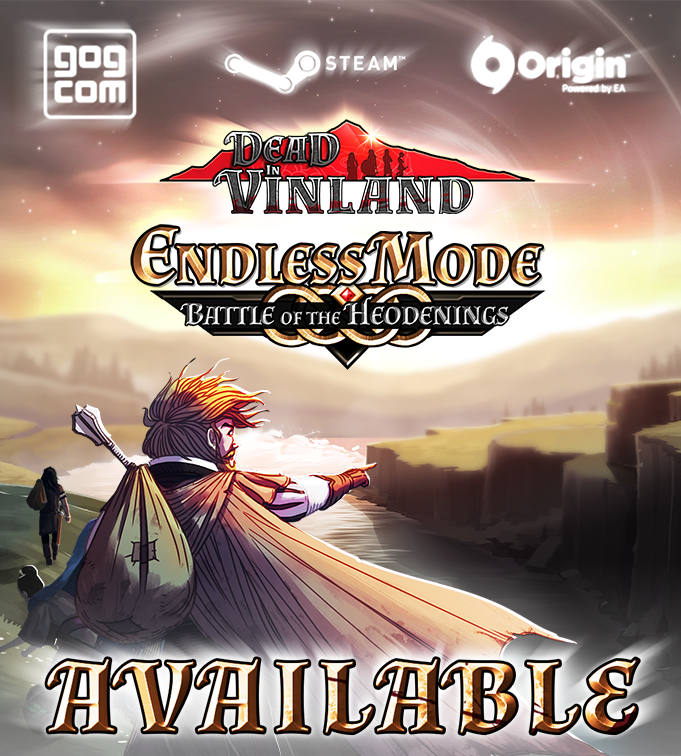 When choosing a new game, owners of the DLC will be able to choose either “Story mode” or “Heodening”, which will launch the endless mode of Dead In Vinland. Generated like in the story mode: they will have the same generation algorithm, so the same overall skills and traits. OR, Randomly generated: the game will follow the same generation rules than in the story mode (i.e. the same amount of total skill points on every character), but all their starting skills and traits will be procedurally generated! Any time your want to add a character to your camp, you can first check their starting skills, traits, and fighting skills. If you want, you can spend 1 Orichalcum Bead to customize their starting skills. You don’t have to recruit him/her right away, his/her skills will stay like this until you recruit him/her. You can also customize again and again the same character, even if it’s not really recommended since Orichalcum Beads are rather hard to get (you start the game with some to customize your starting crew). Here, you’ll be able to spend 120 points on Innate skills and 300 points on Acquired skills. You can see that Innate skills can’t be lowered under 20 points each, and Acquired skills under 10 points. You also have a 80 high cap for innate and 40 for acquired. These are the same rules used in the random generation. Thor gives temporary battle buffs. Now the tributes are endless: they start right away, and every week Elof will come ask for the tribute. The dialogs are at their minimal, and always the same: you’ll be able to pay him the exact amount asked, 25%, 50% or 75% of this amount, or 125%, 150% or 175% of this base amount (or nothing at all). Of course, if you give him more or less than asked, the Animosity gauge will still change accordingly. You’ll still get retribution events every 10 steps of the gauge, and if you reach 100% animosity you’ll lose the game. To make the game truly endless, we’ve reworked the map for this mode. Every number of days (for now, it’s 25), all the empty cells of the map will regenerate a random content. Now the enemies you will face will automatically get an increasing number of random Traits the more days you stay on the island. We also made a new encounter’s table: you may fight harder stacks early on, but they will have 2 bad Traits until a few dozen days have passed. You may also encounter one of the 5 boss fights in the game. Modify how the states increase/lower each time. You could for example play a game where the characters don’t get any Fatigue at all, but they get twice the amount of Injury and Disease. Modify how the states impact the skills: you could make it so the characters’ states don’t lower the character skills, of have twice the impact. Modify the random value affected to Acquired skills at generation: choose 0 to have less random, 100 to have crazy numbers. Modify the number of bad starting Traits: you could start a game with 0 random starting Traits, making it fairer to every character. Modify skills and general XP bonuses. You could make a game with skills that don’t evolve at all on each use, but you get twice the general XP, making it a game around level ups! Modify the number of Level Up Traits you get to choose from each level-up. If the random factor of level-ups annoys you, you could set it up to 100 and get the choice to customize your character freely. Change the resources gains, the crafting speed, the exploration speed. Change how fast camp stations lose condition, and how fast Natural Resources lower and regenerate. Remove the chance to have special Traits when using camp stations, or double the chance to get one, and change the value of “Depression Crits”. Make the diseases more or less frequent, and make them harder or easier to heal. For Heodening mode only: Modify the number of days you have to wait between Tributes, and the difficulty of Tributes amount asked. Change the animosity gains. You could make an endless game by removing them completely. Some other parameters for Heodening mode: the delay between map resets, and the pace at which the battles will increase in difficulty. And finally, one set of options that I’m particularly proud of: you can completely modify the probabilities each weather has to appear, depending of the current weather… Very cool! You could make an island where it constantly rains, or where there are no storms, etc… You’re a real god now! Intelligence skill reworked: now modifies skills XP gains, instead of doing… nothing. Fixed a nasty bug which prevented Angelico’s main event chain to trigger. Lowered depression cured in relax mode by 5. Relax mode has now 10% chances to give Bored trait and 10% chances to give Demotivated trait. That’s right, there was ONE LAST THING we still haven’t told you about! 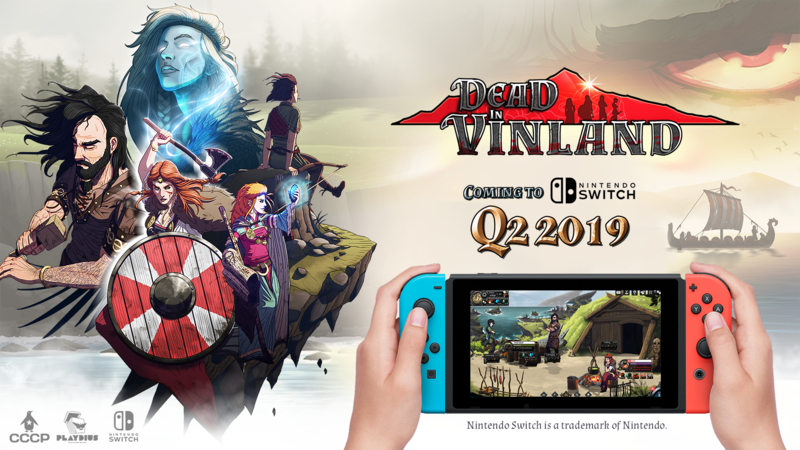 We are very happy to announce that we’re going to release Dead In Vinland on Nintendo Switch! Stay tuned! “Battle Of The Heodenings” is available for $4.99/4.99€/£3.99. And the new features/improvements included in the 1.3 Patch are of course free for every owner of Dead In Vinland! PreviousPrevious post:Post Natal #14 – Norse Side StoriesNextNext post:Post Natal #12 – Free 1.3 Patch + Release date! Post Natal #8 – The Vallhund is available now!